Tips for Your Best Cleanse Day* Ever! The most important thing to remember is that there are many ways to be successful on Cleanse Days* – it just takes finding the ways and habits that work best for you. Take ownership of your Cleanse Day, personalise it to suit your needs and body, and the motivation and commitment will come with far less effort than you’d think. Before you know it, you’ll be happily maintaining your health. To help you get there, here are a few of our top tips! During a Cleanse Day*, the temptations to slip up can be overwhelming. Whether it’s your co-workers convincing you to cave into unhealthy lunch options or late-night boredom that challenges your motivation, it can be easy to stray from your Cleanse Day* commitment. The best way to avoid these temptations is to set a schedule outlining your plan for the entire day including when to drink Feel free to tailor Cleanse Days* to suit your lifestyle! Nourish for Life can be enjoyed in multiple ways! Add warm water to enjoy it like a cup of tea, or add ice to make a cool and refreshing drink in the afternoon. Personalisation is key to taking control of your Cleanse Day*, and you’ll be more likely to stick with the plan! Due to consuming fewer calories on a Cleanse Day*, you may feel tired toward the middle of the day or during the afternoon and your body may not be able to perform at the same level as on Shake Days. Take it easy if you need to and head to bed early for a good night’s rest. You don’t have to feel deprived on a Cleanse Day*! 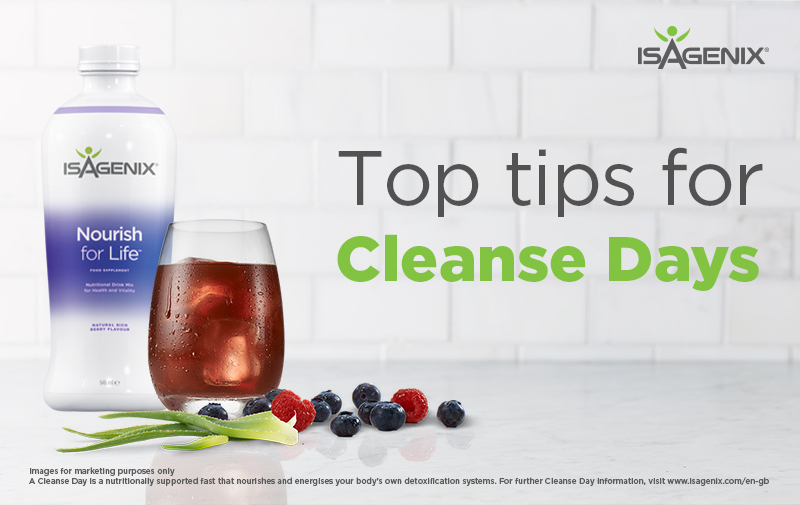 Isagenix has delicious snack products to treat your taste buds on Cleanse Days* including Isagenix Snacks and IsaDelights. If you find yourself hitting a wall, an e-Shot may help you through. e-Shot contains naturally sourced caffeine from green tea and yerba mate to help you feel alert when you need it most. It can be easy to misinterpret our thirst mechanisms. Often, we can think we are feeling hungry when actually we’re thirsty; meaning we’ll reach for high-calorie foods when in fact all we need is a glass of water. Aim to drink plenty of water every day including on Cleanse Days*! Although high-intensity exercise is not recommended on Cleanse Days*, engaging in light physical activity such as walking or yoga can be beneficial. These low-intensity forms of exercise are less likely to put high amounts of stress on the body and can increase calorie expenditure. Additionally, these activities can act as distractions from eating and can even help to provide motivation to stick with your Cleanse Day* plan. Just remember to listen to your body and keep activity light! Have an IsaLean Shake for your first post-Cleanse Day* meal. After a Cleanse Day*, your body will be craving food. What better way to give your body the nutrients it needs than with an IsaLeanTM Shake?